Bono, Bill Clinton, Chef Jamie Oliver, Sarah Parcak, Ph.D. UAB’s renowned space archaeologist is in good company as the winner of the 2016 TED Prize, which offers a no-strings-attached opportunity—and $1 million—to fulfill a bold “wish” that could change the world. Previous winners have developed projects to combat poverty, address religious intolerance, fight childhood obesity, and improve global health and education. Satellite imaging maps buried streets and structures in Egypt's ancient city of Tanis. Armchair archaeologists soon will be able to join Parcak on the hunt for historical treasures. Here’s how Parcak’s wish will work: An app will enable anyone to evaluate satellite images—stripped of specific location data to protect sites—and search for hidden buildings, tombs, and other treasures, as well as signs of looting. All discoveries will be shared with authorities who can excavate or protect the sites, and the online explorers will accompany archaeologists on digs via Skype, social media, and other digital platforms. Parcak has pioneered the use of infrared imagery from satellites to reveal ancient sites by identifying subtle changes in the Earth’s surface. In Egypt alone, she has unearthed 17 potential unknown pyramids, 1,000 tombs, and 3,100 settlements—including Indiana Jones’s fabled lost city of Tanis, which blew the mind of Stephen Colbert when Parcak appeared on his Late Show. 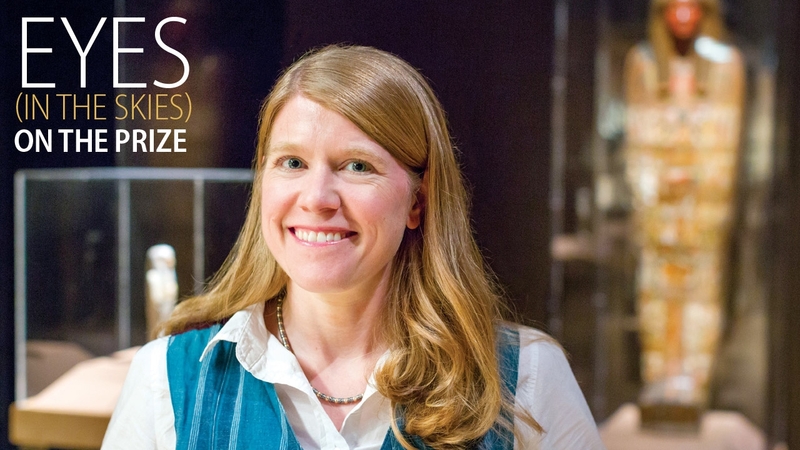 Her team also has pinpointed ancient sites across Europe, the Mediterranean, and the North Atlantic, and has made headlines for a discovery in Canada that could rewrite the history of Viking colonization in North America. She is both a TED Fellow and National Geographic Fellow/Emerging Explorer whose work has been featured everywhere from the BBC to the Discovery Channel. She also wrote the first textbook on satellite archaeology. Help Parcak save history at globalxplorer.org. • Learn more about the academic opportunities offered by the UAB Department of Anthropology. • Give something and change everything for UAB anthropology students and faculty.